The 30-year-old McFly drummer has opened up about how when he and bandmates Dougie Poynter, Tom Fletcher and Danny Jones teamed up with Busted's James Bourne and Matt Willis in 2013 to form the supergroup their supporters weren't best pleased and so they just knew they had to go their separate ways. Harry admitted: "The McBusted thing was a huge success, but it fizzled out. "We're all quite polite and none of us like confrontation. "The last show happened and it was like, 'Ok, bye!' We knew it, but it was unspoken. We were cool with it." 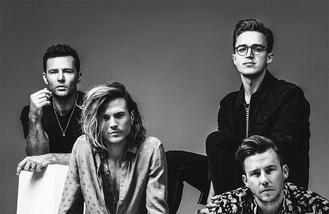 Following a three-year hiatus, McFly are back on the road on their 'Anthology Tour' and Harry says they are keen to get new music out because their fans were "frustrated" with McBusted. Harry told the Metro newspaper: "It's been a while since we have just been McFly and a lot of our fans are frustrated. "Although McBusted has been a success, a lot of McFly fans were like, 'I hate McBusted!'" The 'Shine a Light' hitmakers returned to the stage for the first time in three years on Monday night (12.09.16). They played the first show of their 'Anthology Tour' at Manchester Academy, north west England, and joked they shouldn't have bothered turning up because their set was full of errors. Harry quipped: "I've made at least five mistakes. The first mistake was turning up." Dougie also admitted he was "sweaty and unprepared" and didn't have a "f***ing clue" what he was doing on stage. The group will play two further dates in Manchester before heading to Glasgow's O2 Academy, Birmingham's O2 Academy and London's O2 Forum in Kentish Town for three concerts at each venue.